I've been quite active the past holidays period - time to shower myself with some tarot presents, and yes I found some gems, like this one. I already had some music inspired decks, and each and every one is very different from the others, after all music is a very personal and emotional subject often linked to intense emotions and/or important memories - thus the artist is this way showing a very intimate part of his or her personality and feelings at this moment in their life. Judging by the looks of the box and the large prints (30 x 17 cm) Miss Meier is a very extra-vert even wild strong woman! 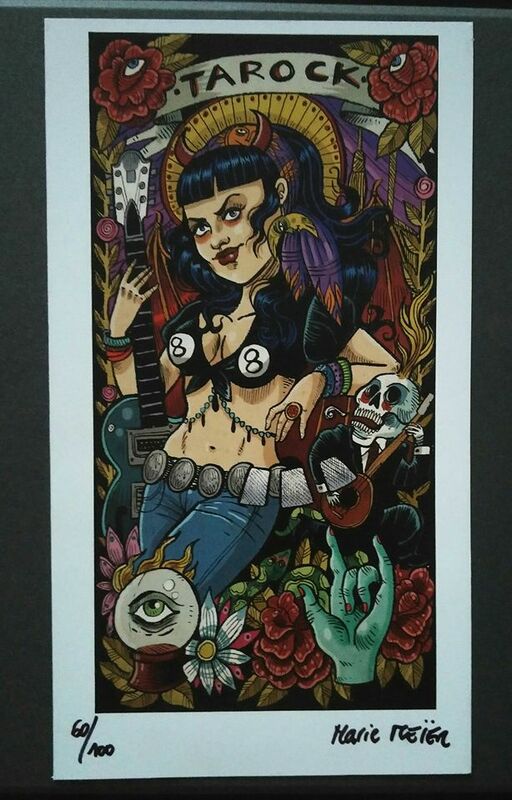 The deck was previously exposed at Perpignan (France) and is printed in a limited edition of only 100 majors set with a "stay rock" print and also 4 cards collector pin up cards 17 x 15 cm. Where the extra cards and the one on the box are bold and colorful the Facsimiles of the 22 Major arcanas are equally striking but in strong black and whites with some grey shading, each and every one reflecting the personality and style of the artist(s) depicted, who are most of them looking directly at you.